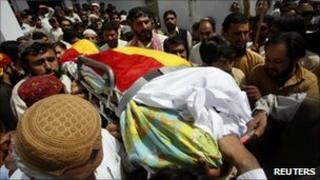 A former senator from the Pakistani province of Balochistan has been shot dead in the provincial capital, Quetta. Habib Jalib was killed by two unknown gunmen outside his home in the Musa colony, police said. He was the Balochistan National Party's secretary general. Angry supporters chanted slogans and protested against the killing in Quetta. Another Baloch politician, National Party's Maula Bukhsh Dashti, was assassinated in Turbat town on Sunday. His attackers escaped on a motorbike. Mr Jalib was a Moscow-educated lawyer with a reputation as an intellectual and an articulate politician. Police say they are investigating whether Wednesday's was a targeted killing. Protests over the killing have forced several shops in Quetta to shut down. All schools and colleges, including Balochistan University, will remain closed for two days. A large number of police and security personnel have been deployed in the city to keep peace. President Asif Ali Zardari condemned the assassination, describing it as "a heinous and despicable act". No group has said it carried out the attack and it remains unclear who might have shot Mr Jalib. The BBC's M Ilyas Khan in Islamabad says the National Party has been under pressure from separatists in Balochistan to abandon using political means to achieve its goals. Separatist groups in the province have carried out targeted killings of their opponents but they have also been blamed for killings which they deny, our correspondent says. Pakistan's shadowy security agents are also frequently accused by Baloch politicians of orchestrating targeted killings of popular leaders and then blaming insurgents.